Exfoliating your skin at home is one of the most popular and cost-effective ways to keep your skin looking youthful. However, even with regular usage of deep cleaning scrubs or even using over the counter microdermabrasion kits now available from many beauty stores, the top layer of skin on your face consists of a tiny layer of dead skin cells that can be professionally removed so that your skin will feel smoother and tighter than ever before. 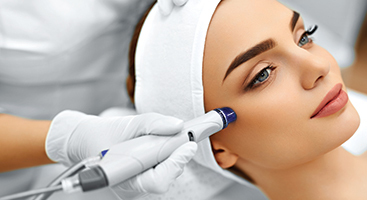 Microdermabrasion is one of the most popular services offered by Rejuvenation Medi-Spa, and as Maryland’s Top Rated Local® skin care facility, this non-invasive procedure can have your skin looking younger, and often in less than an hour. The microdermabrasion offered at our skin clinic requires minimal recovery time, so by the end of the treatment, you are ready to continue on your with daily routines with smoother skin and smaller pores. At Rejuvenation Medi-Spa, our professional staff will carefully perform our microdermabrasion procedure to exfoliate your skin, eliminate light aging spots, and even reduce the size of your pores. This is an excellent choice of cosmetic treatment because there are very few known side effects, and the procedure is non-invasive. However, because the goal of microdermabrasion is to remove the top layer of dead skin cells that regenerates approximately every 30 days, it is recommend to schedule microdermabrasion treatments every two to four weeks. In order to keep your skin looking its best, schedule a microdermabrasion appointment online, or call Rejuvenation Medi-Spa today at 443-291-7302 to book a facial treatment at either of our Maryland skin clinic locations in Prince Frederick or La Plata. Don’t forget to check out our monthly medspa treatment promotions to see how you could save on microdermabrasion today!